Sophia Omotola Omidiji is a Nigerian-American born, female footballer raised in Las Vegas, Nevada, USA to a Nigerian father and an American mother. Sophia Omidiji is a full time student, who also play professional football for Excelsior Barendrecht, a female division one team in Netherlands. Family and the city she was born in, which is Las vegas, has been a major source of inspiration for the young female footballer. Sophia Omidiji started playing organized football at age 5 and that really nurtured her love for the sport. Omidiji currently lace her boot for Excelsior Barendrecht, a division one club in Netherlands, while she previously played at KA Gent in Belgium, where she scored 15 goals in 20 games. While speaking with Naija Online TV on her educational background, Sophia Omidiji revealed "as you know, education isn’t an option in a Nigerian household, to be educated isn’t a choice but a must, isn’t an option but a requirement. Nelson Mandela said it best when he said that "education is the most powerful weapon which you can use to change the world". I started school of course in Las Vegas where I graduated from Sierra Vista High School with honors and top of my class. People looked at me like I was crazy becaue I played high school soccer (where I had 98 goals in 4 seasons) and also played club football where we travelled across the United States playing in tournaments and I still managed to graduate with honors because I value my education. Football can come and go, and start and end but my mind will always be here", she stated. Sophia Omidiji is currently a college student studying Business Management at Webster University in Leiden, Netherlands. Sophia Omidiji who was in the Nigerian U-20 female team camp in 2015, shared her experience with Naija Online TV, she said as follows. "First of all I am grateful for the invite. Was a great experience, when we camped in Abuja for three months and there through the qualifiers. Though i didn’t get to make the worldcup list but I firmly believe in the Yoruba saying that ‘with patience, one may tread to success’, the same path by which one had fallen. It’s a new year, new opportunities abound", Omidiji concludes. 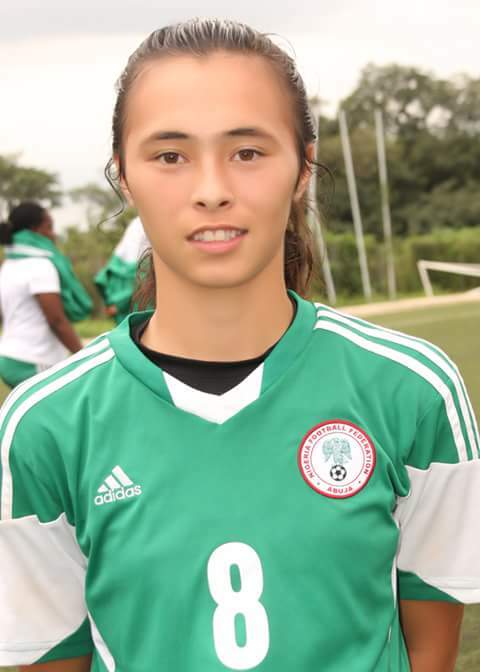 On being recognized and monitored by FIFA for her harwork, commitment and dedication to female football, Sophia Omidiji told Naija Online TV that, " it was an amazing feeling when they did the pre world cup analysis and had her on their website as a player to look out for, though shame she wasn’t at the world cup, but God knows best. It felt good nonetheless ", Omidiji said. On what motivates her hard work on the pitch, Sophia Omidiji revealed, " her motivation is to accomplish her goals, as there is no time for complacency and any fish that sleeps would get eaten up by another fish. I have to keep working hard, developing, improving, bad days will come, but will just keep going. I have younger brothers that play as well so I know I have to set examples for them and when they see the value of hardwork, dedication and determination, it will push them to work even harder". Sophia Omidiji relaxes by spending time with her family, shopping, travelling and playing FIFA 18 against her brothers.